Chicken has long served as a mainstay of the dinner table. It can be prepared in countless delicious ways, for a weeknight or a special dinner party. In this episode, Martha shows viewers how to prepare Chicken Paillard — which sounds fancy but is really quite simple — Chicken Pot Pie and Spatchcocked Chicken. Martha removes the chicken tenders from the boneless chicken breasts and saves them to make breaded chicken fingers. Try Martha Stewart's chicken pot pie recipe from Martha Stewart's Cooking School. This recipe appears in the Chicken episode. Place chicken in a large stockpot and add enough water to cover by 2 inches. Bring to a boil over medium-high heat, reduce to a simmer, and cook until chicken is cooked through (until an instant-read thermometer inserted into the thickest part registers 165 degrees), about 50 minutes to 1 hour. Use tongs to remove chicken. When cool enough to handle, pull off and discard the skin, then separate the meat from the bones and tear into bite-size pieces. Reserve 2 cups of stock for the pot pie and the rest for another use. In a large heavy-bottomed pot, melt butter over medium-high heat. Add potatoes, carrots, and onion. Cook, stirring occasionally, until potatoes and carrots are fork-tender, 10 to 12 minutes. Add mushrooms, cooking until mushrooms are heated through. Add cognac and cook for 2 minutes. Add flour and cook, stirring, for 1 minute. Pour in reserved 2 cups chicken stock and milk. Bring to a simmer; cook, stirring constantly, until thick and bubbly, 2 to 3 minutes. Stir in chicken, peas, parsley, and thyme. Season with salt and pepper. Ladle into six (12-ounce) ramekins, let cool. Roll out thawed puff pastry on a lightly floured surface to a ¼-inch thickness. Cut out six circles that are 1 inch wider than ramekins or bowls being used. Cut a 1/2-inch vent hole in the center of each circle. Transfer puff pastry circles to a parchment-lined baking sheet and freeze for 20 minutes. In a small bowl, whisk together egg, egg yolk, and 1 teaspoon water. Remove puff pastry circles from freezer. 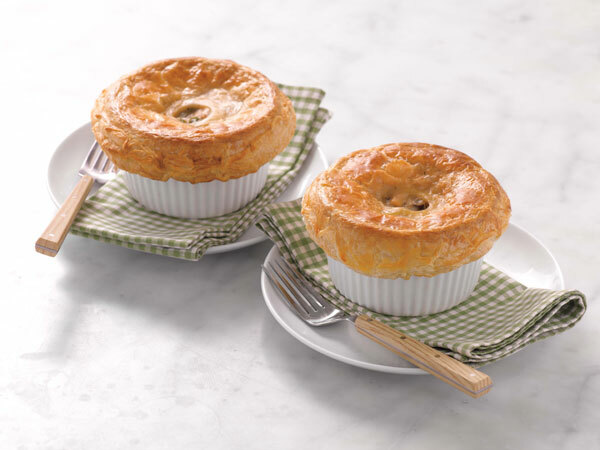 Top each ramekin with a puff pastry circle, crimping edges over sides to seal, and brush with egg wash. Transfer to refrigerator and chill for 30 minutes. Preheat oven to 425 degrees. Transfer ramekins to a rimmed baking sheet. Bake until puff pastry is deep golden brown and filling is bubbling, 20 to 25 minutes.